Marine benthic ecosystems are chronically under-sampled particularly in environments >50m. Yet a rising level of anthropogenic threats makes data collection ever more urgent. 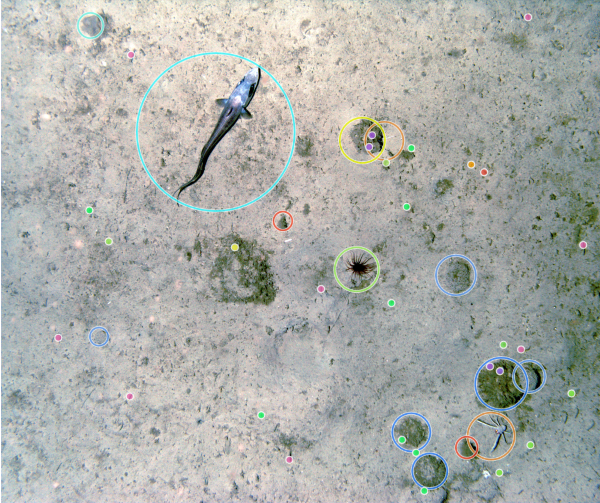 Currently, modern underwater sampling tools, particularly Autonomous Underwater Vehicles (AUV) and Remotely Operated Vehicles (ROV), are able to collect vast image datasets, but cannot bypass the bottleneck formed by manual image annotation. Computer Vision (CV) can be a faster, more consistent, cost effective and a sharable alternative to manual annotation. The application of CV to benthic ecology is in its infancy. Recent research has shown some promising results, however there is a need for further development of both methods and tools available in order to bring CV into the tool box used in benthic biodiversity and ecological studies. This studentship will focus on the development and testing of an effective CV based image processing pipeline. It will test the application of both existing CV tools (for example using Matlab, Google’s Tensor Flow or R based algorithms), as well as novel methods, including use of underwater hyperspectral image data, and hybrid CV models. The student will have a unique opportunity to expand their outlook into a highly multi-disciplinary domain. They will interact with ecologists, computer scientists, engineers, ocean scientists, and photographers, developing a wide network beyond the supervisory team. Depending on their background the student may receive training in ecology and taxonomy, computer vision, machine learning, marine optics, Matlab, R and/or Python programming. The student will spend periods of time at UEA and thus will benefit from interaction with two academic institutions. A degree in either an ecological field, computer science field, or other highly numerate field (e.g. mathematics or engineering) is required. We recognise that candidates are unlikely to have both ecological and programming skills, and are thus looking for someone with a strong mathematical background and a demonstrable capacity to learn new skills and adapt their knowledge to new situations. Skills in the use of statistical and / or computational models (for example GLMS, GAMS, multivariate statistics, machine learning, convolutional neural networks) are essential. Piechaud N, Culverhouse PF, Hunt C, Howell KL. (submitted) Automated Identification of benthic epifauna from images using computer vision. Marine Ecology Progress Series. Woodall LC, Andradi-Brown, DA, Brierley AS, Clark MR, Connelly D, Hall RA, Howell KL, Huvenne VAI, Linse K, Ross RE, Snelgrove P, Stefanoudis PV, Sutton TT, Taylor M, Thornton TF, Rogers AD. (2018) A Multidisciplinary Approach for Generating Globally Consistent Data on Mesophotic, Deep-Pelagic, and Bathyal Biological Communities. Oceanography 31(3), https://doi.org/10.5670/ oceanog.2018.301. Schwarz, J.N., (2001). The use of high spectral resolution in situ optical data for monitoring case II (coastal) water quality. PhD University of Southampton.